Abstract: Cinema was a product of the second-stage Industrial Revolution. This article examines some aspects of the technological and economic history of cinema and that revolution. It draws on secondary material on the electrical and chemical developments beginning in the late nineteenth century, and on primary research on particular case studies where cinema technology was used to further the economic objectives of industrial and financial organisations. I was asked some time ago to contribute to a discussion on the function and value of a technological history of cinema. The remarks I made are reproduced here, and I have resisted the temptation to substantially rework them. What is lost from a fully worked out and carefully constructed article is, perhaps, gained in the looser and slightly more polemical framing of this. I am particularly interested here in thinking about how cinema emerged in the context of the broader transformations of the second stage of the Industrial Revolution, itself powered by a particular formation of capitalism, and how in turn this form of media and spectacle helped enable the expansion of that conjuncture across a world system (see also Grieveson, “The Cinema”; “The Work of Film”). It is a commonplace of industrial history that the last third or so of the nineteenth century saw a second-stage Industrial Revolution driven principally by new discoveries in electricity and chemistry. Around the turn of the century these developments led to the rapid and extensive mechanisation of industrial production that underpinned the diffusion of mass production methods as well as the emergence of new organisational procedures and the formation of new corporate forms (and intra-corporate or monopoly organisation, frequently predicated on the corporate monopolisation of technological intelligence which became essential to profit maximisation: in this way, technological knowledge was increasingly privatised). Industrial capital produced a surplus reinvested as finance capital, motivating globalising practices (either colonialist or, as with the U.S., an economic imperialism increasingly divorced from geographic possession and later supported by ostensibly neutral international institutions like the World Bank). Like it was in the Industrial Revolution, when the steam engine enabled the greater circulation of raw materials and manufactured goods, so it was that the new industrial and economic practices of the echo-boom of the revolution were twinned with developments in transportation and communication technologies—now automobiles, airplanes, telegraphs, telephones—and the construction of large modern technological systems that subtended new economic forms of ever more rapid circulation. All of this was accordingly supported by liberal capitalist states through policies that increased research potential (and here investments in schools and universities were critical); the potential circulation of materials on rails, roads, international canals, airways; and macroeconomic policies that developed safeguards for intellectual property rights, facilitated monopolisation, and weakened worker and subaltern resistance. “Technology” accordingly became a keyword from the 1930s onwards, recent scholarship suggests, supplanting earlier terms like “useful arts” that made less and less sense in the face of large-scale technological systems (see Schatzberg). And this shift was facilitated by the close links between universities and business. All to say: it is, then, a truism of modern history that the concurrent emergence or coupling of technology and corporate and increasingly global capitalism, facilitated by liberal states, is one of the most significant developments of the modern world. We live in many ways in the shadow of this. Likely it is already apparent that the tenor of my answer to the question posed by this discussion—what is the value of a technological history of cinema? —is to push thinking in the direction of addressing cinema’s role in a broader technological, and so therefore necessarily economic and political, history. Technology may not be determining, as the Humanities mantra must repeat, but it is increasingly hard to look outside the walls of the cinema and not notice that global economies are quite determining. I personally have next to no interest in a history of cinema technology for its own sake, as a discrete history of a privileged object. Rather, the invitation of this discussion is to pose different questions. What roles, I want to ask, did cinema play in the formation of a corporate liberal political economy? What were the ways that media as a system was integrated with new capitalist practices? What were the logics of capital that made these machines (cameras, kinetoscopes, projectors) or storage substances (celluloid, as a visual and later auditory material and chemical substrate), and what did these machines help make? It is not easy to answer these questions, of course, but let me offer some observations along those lines, some examples drawn from recent scholarship, and some reflections on what this material might do for our understanding of how cinema technology was enmeshed with particular economic and governmental projects. The connections are, of course, myriad. We might start, for example, with the discovery of photosensitive halogen silver salts, crucial to the establishment of photographic film as an improvement on the technology of glass plates. Eastman Company developed this most thoroughly from the 1870s (from which point, of course, it carved out a system of patents to maximise profits). Eastman’s marshalling of chemical knowledge to develop flexible photosensitive film was a critical, formative, technological development for what came to be called cinema. In a 1927 investment report on the moving picture business, the Chicago investment firm of Halsey, Stuart & Co. observed in passing that motion pictures use more silver than the United States mint (qtd in Balio 197). What an interesting image. Where did this silver come from? I don’t know precisely, but here is what I assume: from silver mines, likely enough those in colonised states, and certainly predicated on exploitative and dangerous labour practices. The film in film technology was always already ensnared in complex histories of extraction and exploitation… Quite some time ago now, at a conference in India, I was told by colleagues there that very few Indian films of the 1940s survive because they were destroyed to release the silver content in them. I suppose this was a wider practice, and that archivists would know a great deal about this, and likely I should have known it myself. 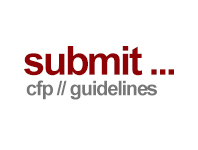 In any case, the connections between film, extractive economy, and the conjuncture of “precious” metals associated with currency, ornamentation, and the chemical basis of photosensitivity is worth remarking upon. In my own research on the Ford Motor Company’s extensive use of film I discovered some evidence that the Company used film technology as part of its elaboration of the mass assembly line (Grieveson, “The Work of Film” 26–7). Time-motion studies at Ford contributed directly to the division of labour into separate and increasingly routinised and mechanised tasks. When combined with the production of machine tools enabling standardisation, this rationalisation process culminated in the momentous establishment in 1913 of the moving assembly line (see Hounshell). It was this innovation that enabled the direct and mechanised control of the movement and pace of workers, dramatically increasing productivity and the extraction of surplus value from labouring bodies (Braverman 127–62). Mass assembly and production was fundamental to the establishment of corporate capitalism. And, through the reduction of costs, it underpinned a mass culture of abundance and consumerism that emerged most clearly in the 1920s (Zunz 73–92). At Ford, this coercive architecture of production enabled automobiles to be produced, as two contemporary observes noted, “like the successive negatives on a motion picture film” (Arnold and Faurote 360). Another interesting image. We might invert it to say: for a time, the successive frames of motion pictures participated in the process by which the outputs of the labouring body could be maximised to produce quickly the identical Model T’s that rolled off the assembly line as perhaps the most emblematic image of the age of mechanical production. I could likely go on, and remind us all (if it were needed) perhaps that the first significant theorist of the cinema, Hugo Münsterberg, was, in his day job, a scholar of “attention” and the problem of directing and harnessing workers attention —but let me shift tack, towards a few brief remarks on the state use of cinema technology. It is increasingly clear that many of the technical innovations in the fields of photography and cinema were financed and first tested for warfare and military objectives and thus there was, in the words of Friedrich Kittler, a “historically perfect collusion of world wars, reconnaissance squadrons, and cinematography” (124). Here we might think specifically about the synergy between the design of automatic weapons and the camera apparatus (Marey’s chronophotography derived in part from machine-gun technology); the development of 16mm; portable projection technologies in mobile cinema vans to bring cinema as recreation and propaganda to soldiers and diverse populations; and the broader enmeshing of surveillance and state agendas through visual and sound technologies (General Electric, for example, developed aspects of sound technology under the direction of the U.S. Navy: these connections continue in later media practices, though I would need to be a much, much better historian of the Internet to make the precise connections between military objectives, new media, and surveillance). Virilio reminds us that the nitrocellulose in film stock was used also for explosives; and that searchlight technology filtered back into studio lighting practices (288). Liberal and other states used film technology in the state of exception of wartime, certainly, but this practice became regularised, just as—as Giorgio Agamben teaches us—exceptional state practices tend to. 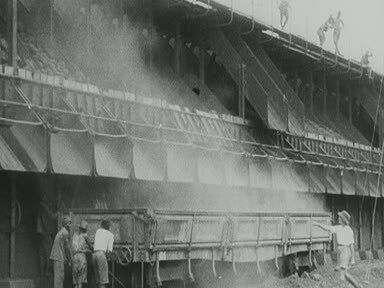 In the U.S. the Departments of Agriculture, Interior and Commerce pioneered the production of film beginning in the 1910s and running through the New Deal. Vans carrying films to ever more remote peripheral regions were developed, capable of using electricity generated from their engines to overcome problems of local differences in electricity current to project these films of government practice to isolated rural populations. 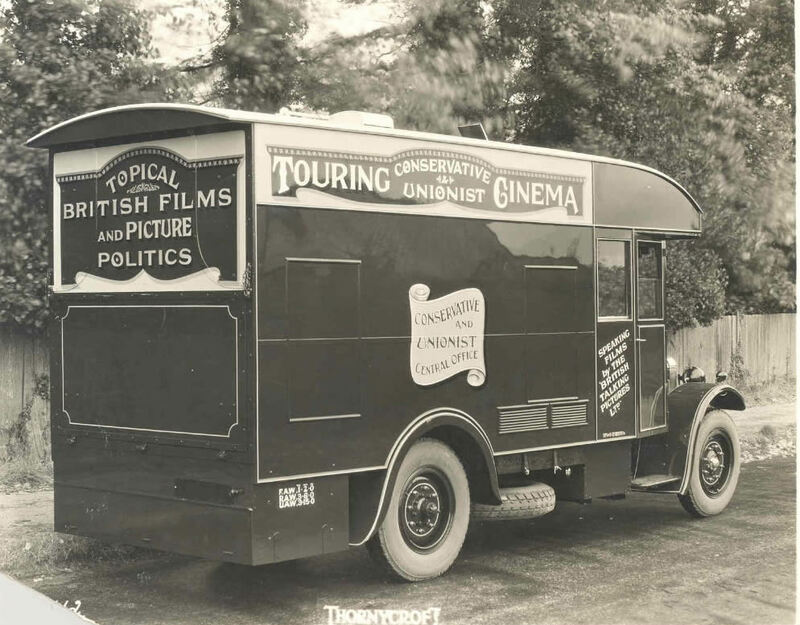 In the U.K. the Conservative party pioneered this use of mobile cinema vans in the 1920s, carrying the films it financed to working-class populations who had become electorally significant after the Representation of the People’s Act in 1918. [Figure 1] It is relatively well known, I think, the subsequent history of these developments in the formation of the Empire Marketing Board Film Unit in 1927 that pioneered various uses of technology to supplement its attempts to establish a colonial economic bloc: not only mobile cinema vans, but also automatic film projectors placed in train stations in London to advertise imperial produce. This is the direct progenitor of all those screens selling us things that populate public space these days. Media technology operated as part of a wider networked infrastructure working to facilitate and mediate the materials, goods and capital that travelled along the same pathways. Figure 1: Conservative Party’s Mobile Cinema Van. 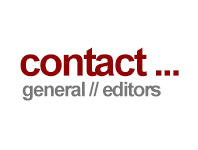 Courtesy of the Modern Records Centre at the University of Warwick. Later, the use of mobile cinemas was imported to the empire, with the intention frequently of using film to “educate” colonial populations, to create modern colonial subjects, and to bind populations into an imperial collectivity. Exhibition functioned as a performance of modern colonial power, a kind of ritual of state power that started with film itself as the embodiment of the technological modernity that colonial power claimed for itself. Here film technology supplied the “shock and awe” that facilitated colonial practices. Indeed, EMB and other British colonial films insistently feature technology: a common trope shows raw materials being gathered in the empire, and transported back to the metropole—on the British ships so central to its position of geopolitical and economic primacy in the nineteenth century—where it is fed into great big machines, and turned into the manufactured goods that maintained British economy and the necessary underdevelopment of colonial economies. The fascinated gaze of the camera machine at the various industrial machines that litter the film offers exemplary instances of what Brian Larkin has called “the colonial sublime”, the “effort to use technology as part of political rule” (39). The films make a distinction, though, between the way workers interact with machines, for in the sequences in, say, colonial Africa the machines dwarf workers, who are always supervised in their relatively menial work of fetching and carrying by British officials, whereas in the short sequences in British factories the workers are unsupervised and demonstrate a mastery of complex technology. [Figure 2] The gulf of technological superiority legitimises colonial rule. If this representation belies the history of how new technologies of mass production and Fordist work practices deskilled working-class populations, it does so in the goal of a political logic that seeks to cathect the working class to technological modernity and perhaps even more substantively to associate the power of machinery with that of capital and state. The machinery of state powers industrial machinery, witnessed here (and so facilitated) by the actual and figurative machinery of film. Figure 2: West Africa Calling (1927). Courtesy of the British Film Institute National Archive. I will end here. I have made no reference to the expansion of commodity capitalism into the sphere of leisure, or to the screen as a technology of display. All the examples I have given have, instead, been from what we might call nontheatrical cinema, or, following Charles Acland and Haidee Wasson, “useful film”: the attempts by various organisations, from states to corporations to educators and reformers, to use film and its related technologies to supplement what I would describe as a corporate liberal political economy. It is in these connections, in the ways cinema gets cathected to—and helps orchestrate—economic and political projects that I see the most value for thinking carefully, again, about cinema and technology. The “Impact of Technological Innovations on the Historiography and Theory of Cinema” conference was organised by André Gaudreault and Martin Lefebvre as part of the Permanent Seminar on the History of Film Theories in Montreal in late 2011. My thanks to Martin in particular for the invitation. The conference was held at the English and Foreign Languages University in Hyderabad. My thanks in particular to Madhav Prasad for the invitation. Thompson argued that industrialisation fundamentally changed the understanding of time and of labour practices, shifting production away from workers managing their own schedules in a focus on particular tasks often correlated to seasons or cycles—for example, harvests—to one that subdivided tasks and regularised timings. A compilation of some of these films is available online from Prelinger Archive at http://www.archive.org/details/OriginalFilm. Münsterberg played a significant role in the development of industrial psychology in America and his book Psychology and Industry Efficiency, published in 1913, is seen by some as the founding work in the discipline (see here, in particular, Hale). The history of this process is told on the Colonial Film Website at http://www.colonialfilm.org. Acland, Charles, and Haidee Wasson, eds. Useful Cinema. Durham, N.C.: Duke U.P., 2011. Print. Agamben, Giorgio. State of Exception. Trans. Kevin Attell. Chicago: U. of Chicago P., 2005. Print. Arnold, Horace L., and Fay L. Faurote. Ford Methods and Ford Shops. New York: The Engineering Magazine Company, 1915. Print. Braun, Marta. Picturing Time: The Work of Etienne-Jules Marey (1830–1904). Chicago: U. of Chicago P., 1992. Print. Braverman, Harry. Labor and Monopoly Capital: The Degradation of Work in the Twentieth Century. 1974. New York: Monthly Review Press, 1998. Print. Dagognet, François. Etienne-Jules Marey: A Passion For The Trace. New York: Zone books, 1992. Print. Grieveson, Lee. “The Work of Film in the Age of Fordist Mechanization.” Cinema Journal 51:3 (Spring 2012): 25–51. Print. Grieveson, Lee. “The Cinema and the (Common)Wealth of Nations.” in Empire and Film. Eds. Lee Grieveson and Colin MacCabe. London: BFI, 2011. 73–113. Print. Hale, Matthew Jr. Human Science and Social Order: Hugo Münsterberg and the Origins of Applied Psychology. Philadelphia: Temple U.P., 1980. Print. Halsey, Stuart & Co. “The Motion Picture Industry as a Basis for Bond Financing.” The American Film Industry. Ed. Tino Balio. Madison: U. of Wisconsin P., 1985: 195–217. Print. Hounshell, David A. From the American System to Mass Production, 1800–1932. Baltimore: John Hopkins U.P., 1984. Print. Kittler, Friedrich A. Gramophone, Film, Typewriter. Trans. Geoffrey Winthrop-Young and Michael Wutz. Stanford, CA. : Stanford U.P., 1999. Print. Larkin, Brian. Signal and Noise: Media, Infrastructure, and Urban Culture in Nigeria Durham, N.C.: Duke U.P., 2008. Print. Münsterberg, Hugo.“The Photoplay: A Psychological Study, 1916.” Hugo Münsterberg on Film. The Photoplay: A Psychological Study and Other Writings. Ed. Allan Langdale. New York: Routledge, 2002. 45–165. Print. Rabinach, Anton. The Human Motor: Energy, Fatigue, and the Origins of Modernity Berkeley: U. of California P., 1992. Print. Schatzberg, Eric. “Technik Comes to America: Changing Meanings of Technology Before 1930.” Technology and Culture 47. 3 (July 2006): 486–512. Print. Thompson, E.P. The Making of the English Working Class. New York: Vintage, 1966. Print. Virilio, Paul. War and Cinema: The Logistics of Perception. Trans. Patrick Camiller London: Verso, 1989. Print. Zunz, Oliver. Why the American Century? Chicago: U. of Chicago P., 1998. Print. Grieveson, Lee. “What is the Value of a Technological History of Cinema?” Alphaville: Journal of Film and Screen Media 6 (Winter 2013). Web. ISSN: 2009-4078. Lee Grieveson is Reader in Film Studies and Director of the Graduate Programme in Film Studies at University College London. He is the author also of Policing Cinema: Movies and Censorship in Early Twentieth Century America (University of California Press, 2004), and co-editor of several volumes, including most recently Inventing Film Studies (Duke University Press, 2008, with Haidee Wasson), Empire and Film (British Film Institute, 2011) and Film and the End of Empire (British Film Institute, 2011, both with Colin MacCabe).